Using the data gathered from the EMBC Incident Reports (see previous posts) it is possible to do a little investigation into what rescue techniques are used, and how frequently. This is important to gauge their relative importance and prevalence in the SAR toolkit. 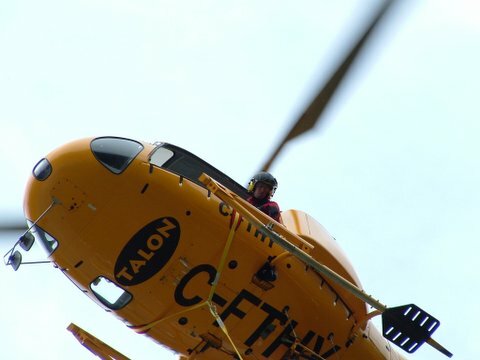 The incident summaries record the teams involved in a rescue, and usually also refer to the primary method of rescue and the outcome of the search, but not always. Unfortunately, the data is recorded in free text, and requires some “fuzzy” matching. However, they are mentioned, and when you have 10 years of data you can so some analysis of the the frequency and come up with a trend. My caveat is that this is only an estimate of the number of times this technique has been used. This technique will tend to under-estimate the actual number, but I believe that the trend is the interesting thing to make note of. 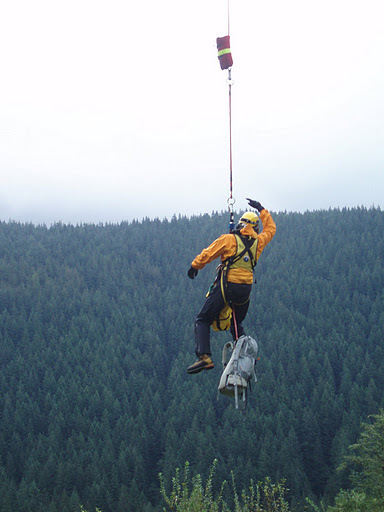 The Long Line technique has a long history in BC, being pioneered as a rescue technique by Canada Parks in the Rockies, and then North Shore Rescue. At present, long line access is a part of the tool kit for about 10 SAR groups in BC, commercial oil and gas exploration, the RCMP and Metro Vancouver staff, BC Hydro, and several other operators. The only certified manufacturer of the long line equipment in Canada is currently not able to make any new kits for reasons explained in a previous post. In British Columbia, Long Line is usually known as HETS which is basically a brand name for a particular rigging system. 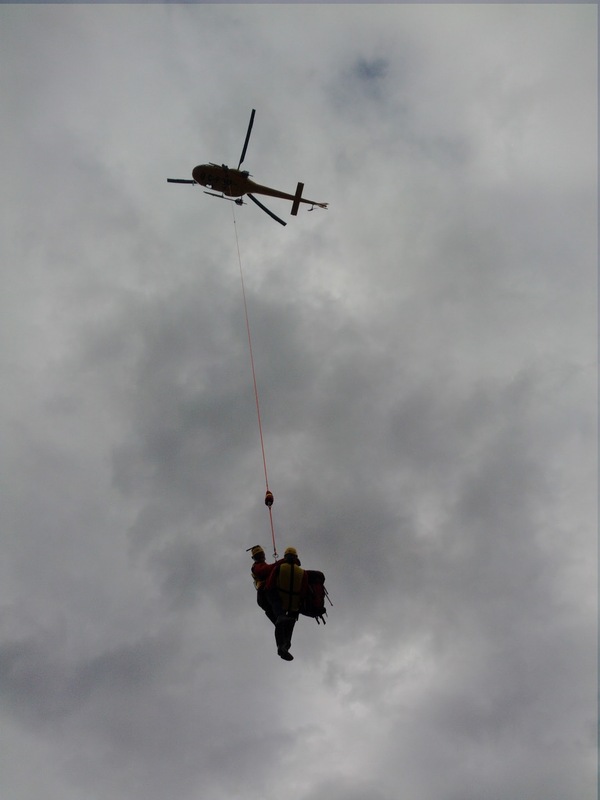 Elsewhere it’s known as “short haul” or “long line” — I prefer long line since it’s the term most of the pilots I know use when slinging loads under the helicopter — in this case the load is me and the person I am rescuing. We can clearly see that the technique “took hold” in 2003, and underwent a small surge in 2005, and a second surge in 2009. This could be because the technique was used only one or two teams early on, and once it proved to be useful and regulatory requirements were worked out, other groups adopted it. Another way to look at the data is by charting what proportion of the total number of SAR incidents involved long line rescue. 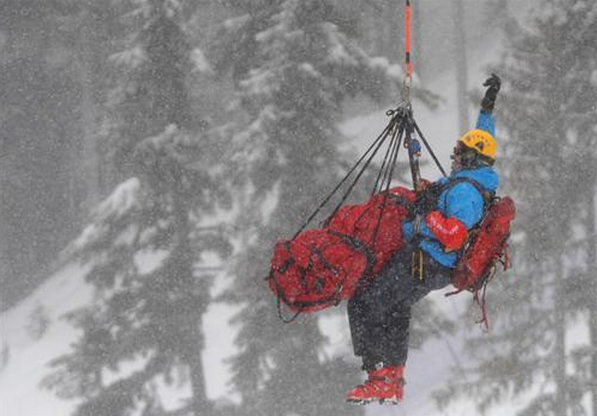 It’s interesting to see that the number of long line rescues in BC as a proportion of the total number of incidents has plateaued at just over 2.5%, and even slightly decreased in the last two years. 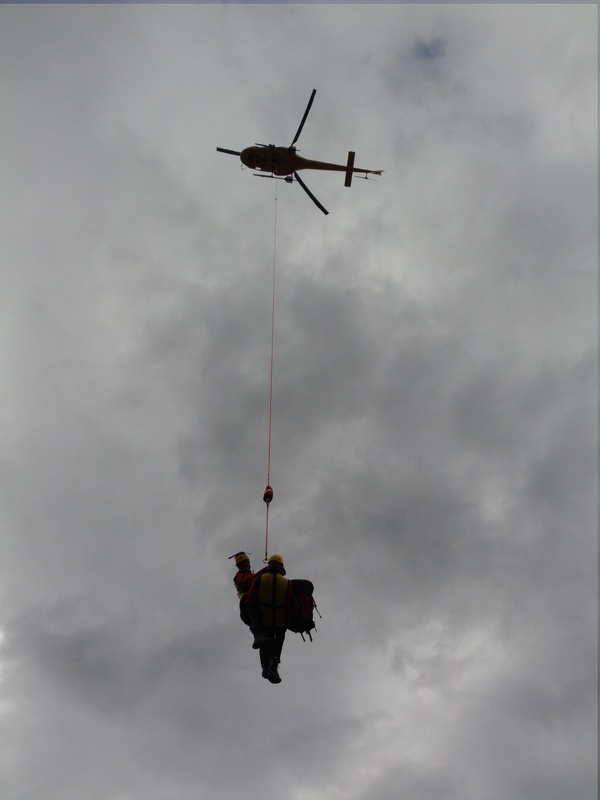 The number of long line rescues grew at a greater rate that that of the total number of incidents in BC over the same period, indicating its spread as a rescue tool. 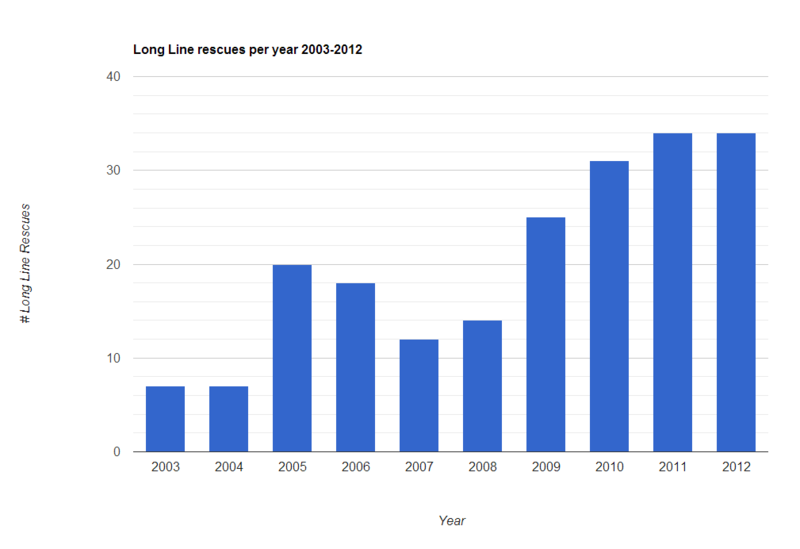 The number of long line rescues in a year as a proportion of total incidents seems to have plateaued, getting information on numbers from 2013 will be interesting. 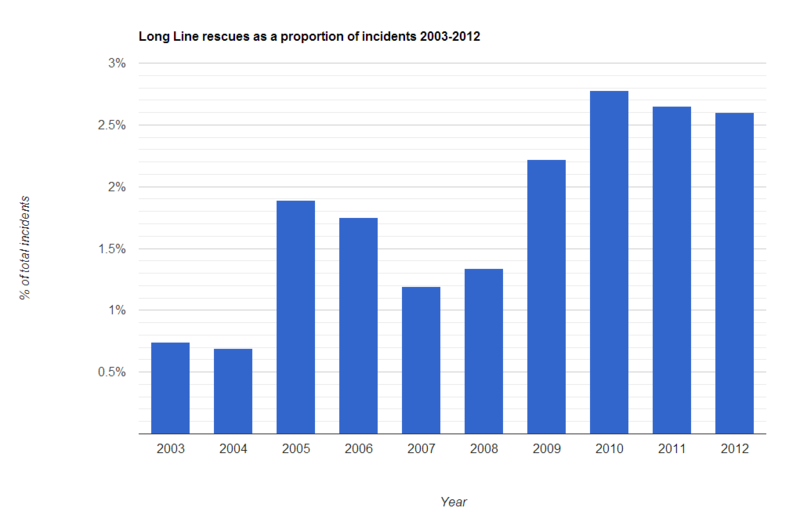 The number of rescues involving long line as a proportion of the total incidents is very small. This seems accurate, but is not indicative of the rescue tool’s importance in the scheme of skills required by various SAR groups. 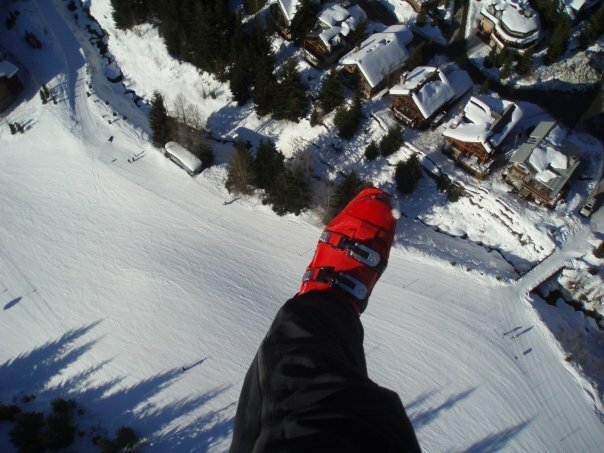 SAR groups feel it is important to have the tool on stand-by for the safety of their members when they are on a task, and for rapid response once a subject is found. 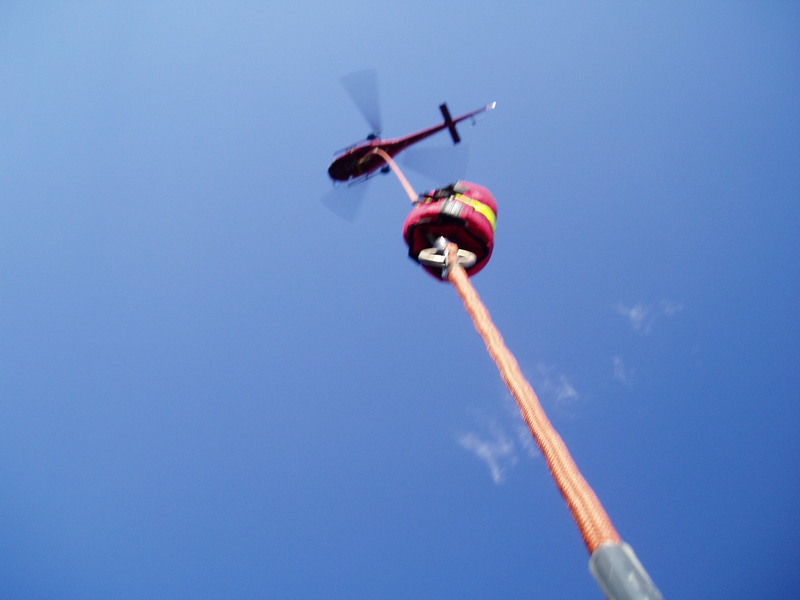 Long line is also used to transport searchers into and out of the field when they need to search steep terrain. Having numbers to differentiate the conditions of the tool’s use would let us understand how it’s used. Finally, it would be good to know the condition of the subjects as many people rescued using this technique are not critically injured, and if long line was not present would be carried out by stretcher. It’s not often you see the introduction of a new rescue technique. It would be nice to have more data on how and when it is used to gauge it’s effectiveness.